In most cases orders are dispatched from our warehouse within 1 to 2 business days. Sometimes this may take longer if the product is not currently in stock and needs to be specially ordered for you. For most Eastern Australia Major Cities, Melbourne, Sydney, Adelaide, Brisbane, ACT. Delivery is normally received next day although please allow up to 2 days from our dispatched date as delays can sometimes occur. If you are located in the following areas - Country, Rural, Northern Queensland, WA, NT, Tasmania please allow up to a week sometimes longer as these areas take longer to deliver to. All Delivery times will vary depending on many factors such as Location, Natural disasters, and peak periods if you're unsure or want more information please contact us. In most cases yes! You can track your delivery online at www.Hunter Express .com.au we will send you a tracking consignment number when we have sent your order with your invoice and you can track your delivery online. In some cases we may use an alternative courier such as Australia Post or a supplier may ship direct. If so we will notify you and we will do our best to arrange tracking of your order if available. In most cases we authorise our courier hunter express to leave your delivery in a safe secure place if premises unattended. If In the case of Australia post deliveries the driver will card for local collection. If your order is being delivered direct from our supplier, we will advise you further when we know the full details. If you have any special instructions for you deliveries please advise us when checking out. What do I do if my light is damaged or not working? We do not accept "change of mind" or "buyer's remorse" as once a fitting has been sold we cannot re sell it. So please be very careful and make sure you are choosing the right fitting. Does my light have a warranty? We pride ourselves on having a selection of top quality lighting. So we make sure you have at least a 12 month warranty on any of our light fittings from our stores. Most light fitting we sell will have a manufacturing warranty for at least 12 months. In some cases this is longer depending on the particular item and manufacturer's terms of warranty. Globes such as compact fluorescent or incandescent have a very short shelf life and do not have a warranty period. LED globes however in most cases depending on the manufacturer usually have a 1 to 3 year warranty. Again this is dependent on the manufactures terms of warranty. Each fitting has different warranty terms and conditions please double check with us if you're unsure. Most importantly make sure your light is tested prior to installation by a qualified electrician. I have returned a product can I get my money back? In the case of approved returned goods due to damage or malfunction, we do not give cash refunds. We will issue the buyer with a replacement of the same / similar product or we can issue a credit to use in our stores to the same amount paid on the original invoice for the returned product. How do I return my product within your "money back guarantee" 14 day period? Please contact us straight away if you not happy with your product within 14 days from the date purchase. All products must be un-opened and un-used. We will arrange to have your products collected by our courier. Once your returned product has been received by us, we will check and process it. If everything checks out we will issue a refund via your preferred financial service provider. All money back guarantee claims incur a 20% restocking fee and we do not refund shipping costs. Shipping costs to and from the delivery location are at the buyers expense. We do not refund any other costs incurred such as electrician costs etc. What is the difference between Warm, Neutral and Cool Light ? Both compact fluorescent globes and the newer LED globes can come in a range of different light colours. 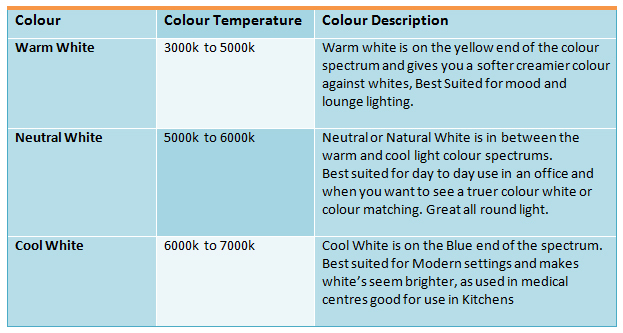 The most common light colours we sell are - Warm, Neutral and Cool White. Each of these colours give off different coloured light of light depending on you use. *Colour temperatures differ from brand to brand. Please use this as a rough guide only. Which colour is brighter Cool White or Bright White? Often people ask which globes are bright Warm White or Cool White? Warm and Cool coloured globes are just as bright as each other. A 9 watt LED Warm globe is just as bright as a 9 watt LED Cool Globe. The only difference is the colour output. What is the best colour light for my application? How long will my globes last? We get this question very often and the answer is often hard and varied. many factors play a part in your light globes lifespan and can all depends on the particular type of light, the manufacturer, the environment the light is in, the electrical current that is running through the light, the temperature the light is operating or stored in, the fitting the light is in and this is just to name a few varied. All these factors add up and sometimes it can be a case of trial and error. Of course we can give you a rough guide to what type of globes will last longer than others but we simply can't speak for every situation. Below are a few guides to globe life. *Please note the above is only a guide as usually advised by our suppliers, globe life will vary. Do I need an Electrician? Or can I install my own lighting? Do not, under any circumstances attempt to wire in your own light fittings. Always call an authorised electrical contractor. Not only is it extremely dangerous to attempt to install an electrical fitting in your home without proper qualifications, it is also Illegal in Australia. You will also void any manufactures warranty on the fitting and if damage does occur such as fire you can also be liable for damages that will not be covered by your insurer. For your own safety please always call a qualified experienced electrician.